It was the place where nightmares are forged. 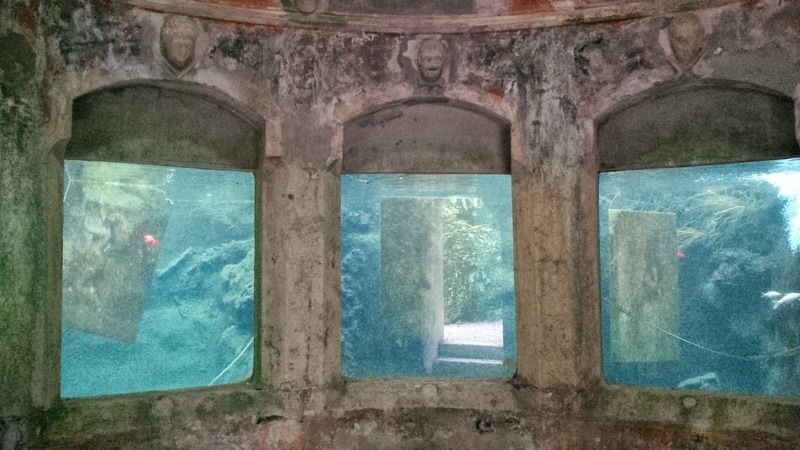 I imagined spending the night there with the submerged faded paintings staring at me from behind the sheet of murky water. The pale moonlight would outline the huge old water tanks. The two or three surviving gold fish would nervously dart back and forth. The thought chilled me to the bone. The vision would stay with me for weeks. It had all started so innocuously though. 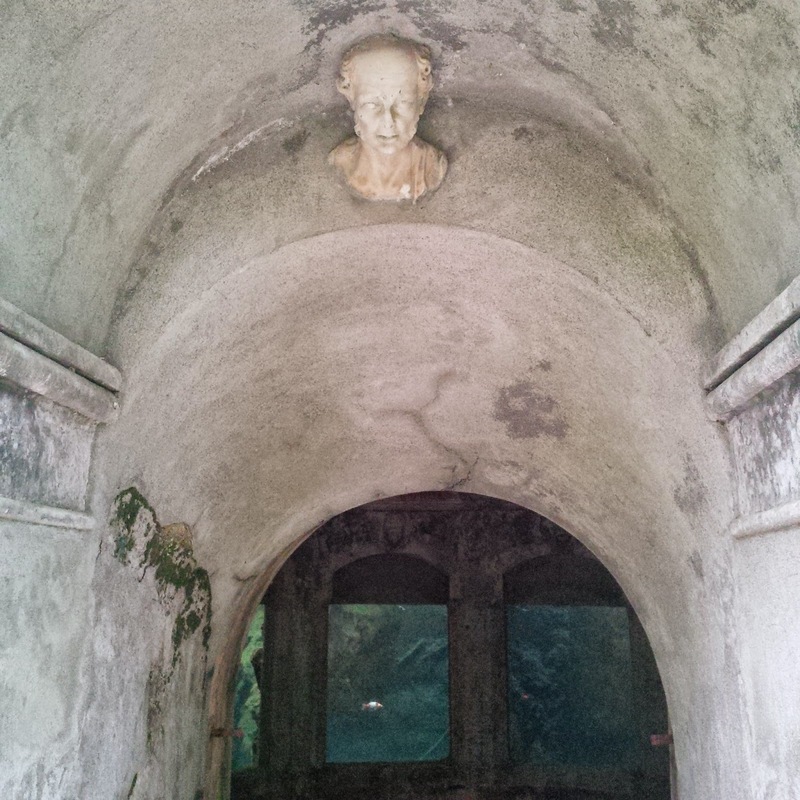 Just like in all good horror movies, we had found the park of Villa Rossi in Santorso by pure chance. Still new to our life in Northern Italy, we were spending our weekends exploring our surroundings and trying to get ourselves acquainted with as many towns, villages and sights as possible so as to establish some new points of reference for ourselves. A short announcement on a website listing local events caught my eye the night before. It said simply that the park would be open for visitors and, unsurprisingly, I was immediately drawn to the name of the place – Rossi. So, come Sunday, we piled in our little red car and less than half an hour later we were there laughing and joking and generally having a fabulous time. 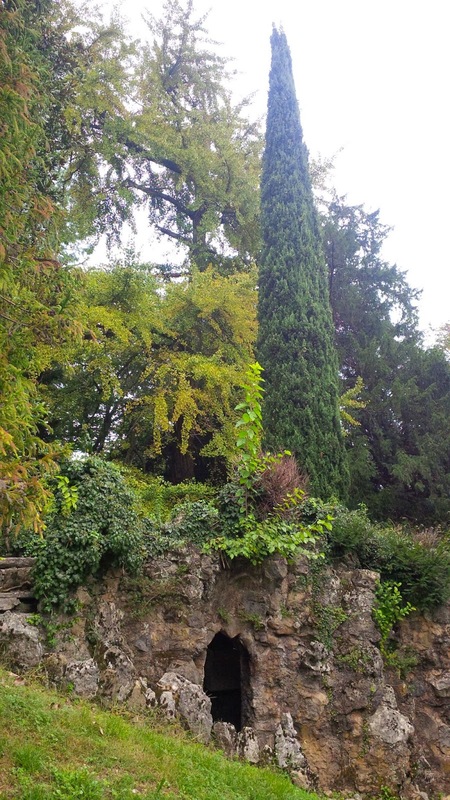 The park of Villa Rossi was surrounded by a huge wall. The branches of tall trees were peeping from behind it waving us in. We walked through the heavy rusty gates and it was like we had stepped in a fairytale. A big pond was stretching ahead of us, surrounded by trees. 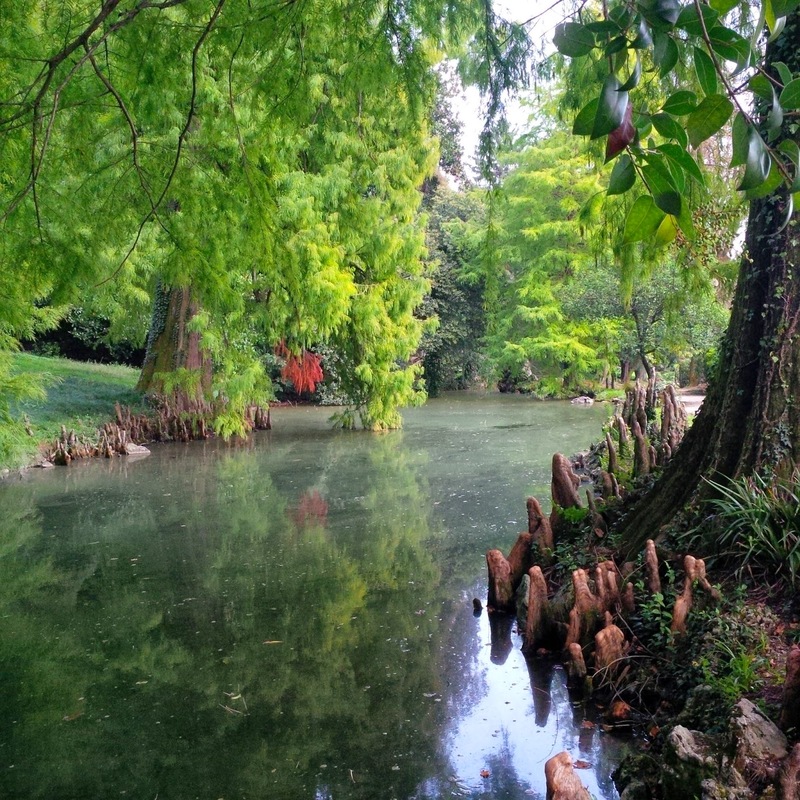 Its waters were green and yet they were shimmering in the light. It was quiet and strangely enchanting. We walked further in, following the gentle curve of the pond. The sensation of being in a fairytale was still gripping us tight, swiftly followed by the impression that something was not quite right. Little details started leaping up at me and I thought: ‘If this is a fairytale, it’s for sure of the scary type!’. 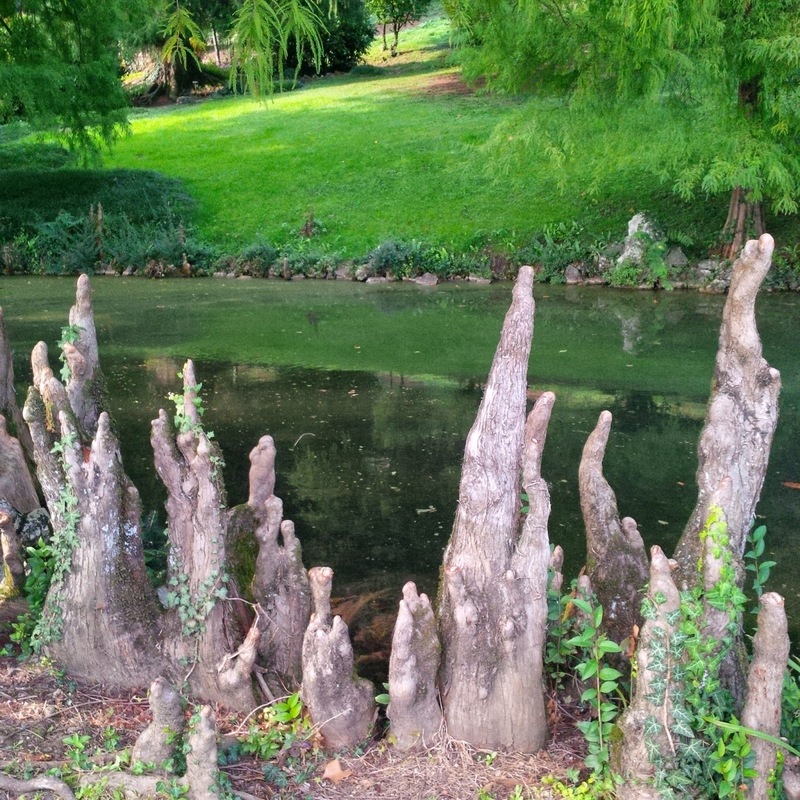 I noticed for example that the roots of the trees were sticking out of the earth like outstretched hands and feet. It was like a macabre gardener had mutilated them and forced them to grow vertically for his own dark enjoyment. And then, further down the path my husband suddenly said: ‘Don’t look!’ and, grabbing me tight by the hand, he walked me past the spot on which, he later told me, laid the mangled dead body of a tiny bunny. A black swan looked at us from the opposite end of a lush lawn. To my relief, he was alive, but rather agitated though. So we gave him a wide berth all the way talking about swans and wondering where its partner was, as swans usually mate for life and are rarely seen without their other half. But then something else caught my eye. This stone outhouse was so reminiscent of the Spanish film Pan’s Labyrinth, that I wouldn’t have been surprised if the door to the underworld was secreted in it. 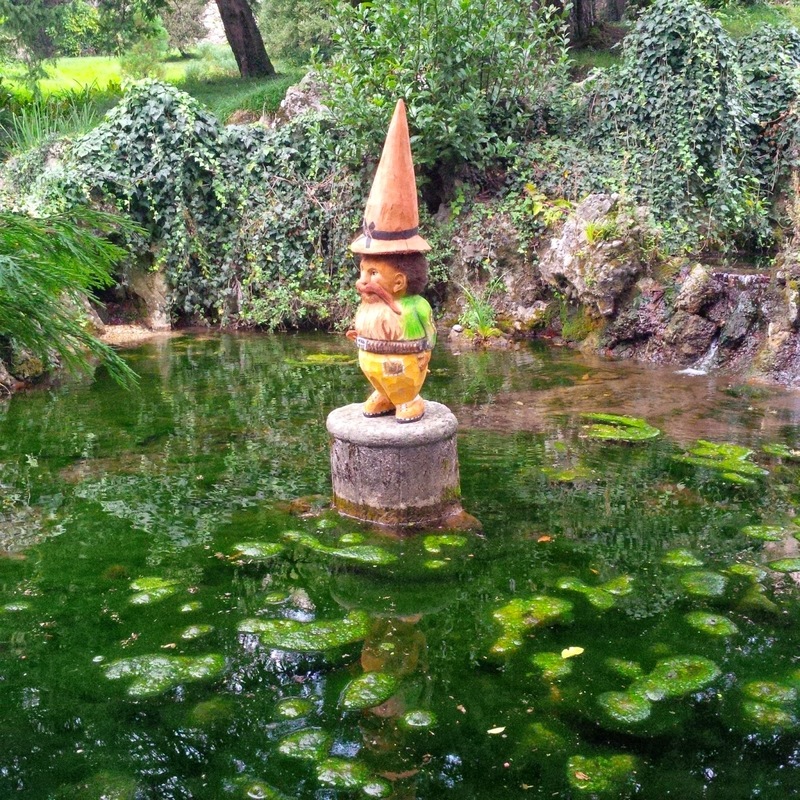 ‘This is a strange place!’, I thought, but I wasn’t quite freaked out just yet. For a little while we simply kept walking around the park. It all seemed decrepit and at the same time looked after just enough so as not to fall to pieces. The paths were crumbling under our feet. The vegetation looked semi-abandoned to its wild instincts. The water in the various water features appeared green from the numerous overgrown plants that had taken hold of the basins. … and others were carved out of stone. This face was the least disturbing thing here though. Walking through the park, we had come across another small building half hidden under a canopy of leaves. 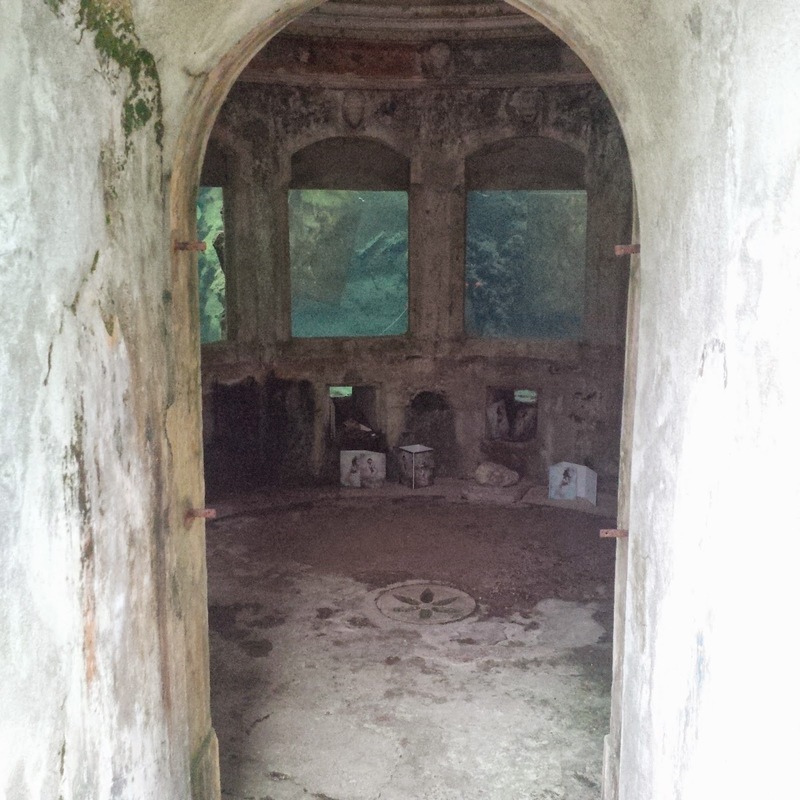 Its walls were cold and mouldy and its vaulted door led us into a scary place. Have you ever been to a place that awakens your worst nightmares?! This was it for me. 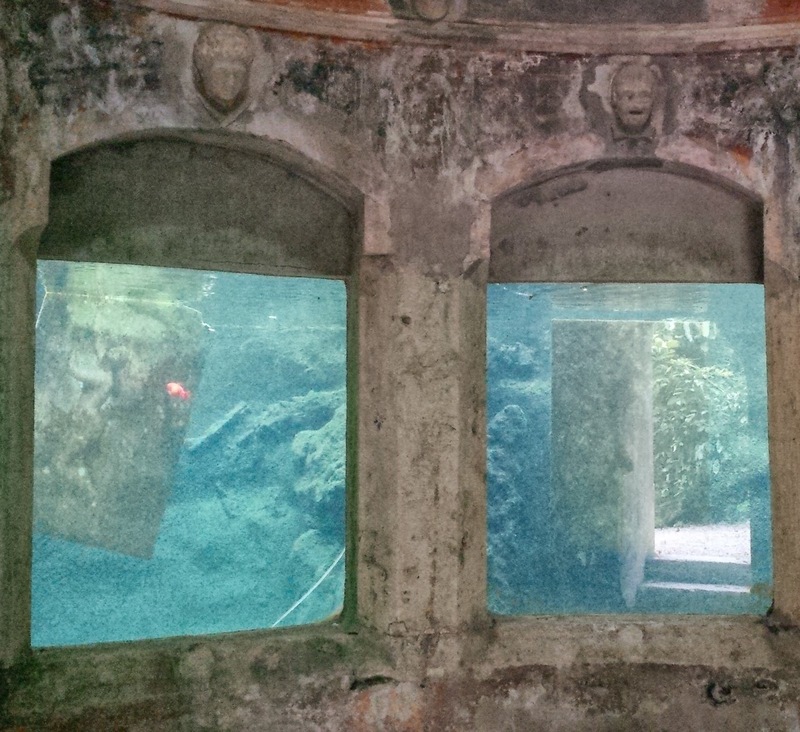 An abandoned aquarium laid in wait to be discovered by us and fill me in with thousand fears and then some. The floor was uneven and cracked, the domed ceiling above us was pressing tightly on me. I could hear my heart beat faster and faster and I was terrified to look behind my back. The water tanks had long ago lost their more interesting inhabitants and only two or three still surviving gold fish were nervously darting back and forth in the murky water. The thick glass panes were cracked. 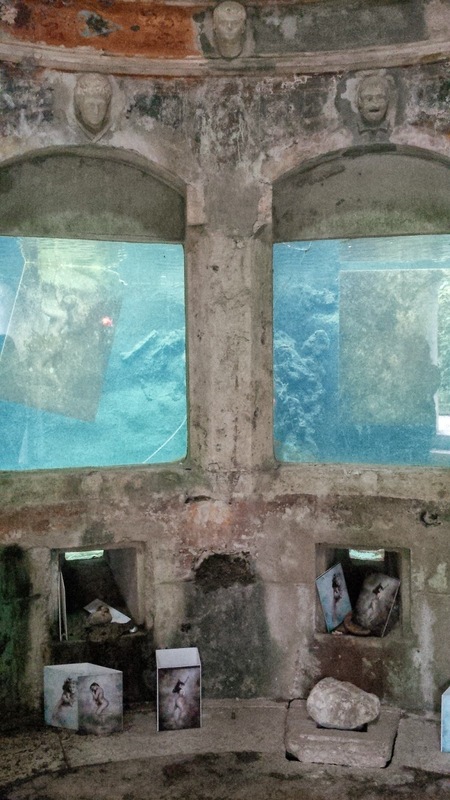 There were no plants in the tanks, just what seemed like bare rock. In this ghoulish set up, my eyes were fixed on a most macabre sight. 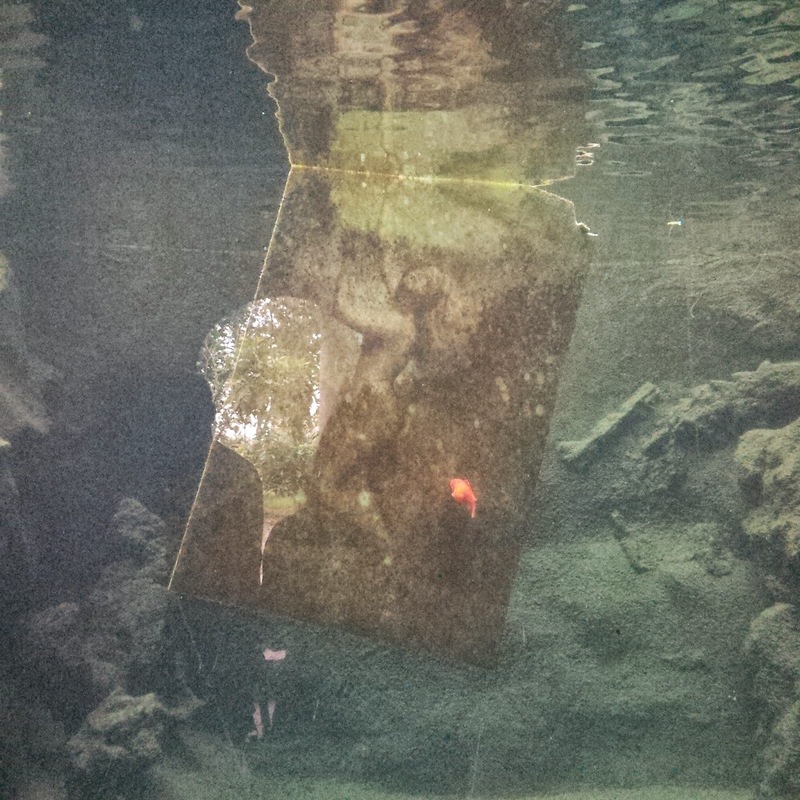 Large paintings were suspended in the water. It would appear they had spent a really long time in it, as they were really smudged. I could just about made the outline of ladies posing provocatively as mermaids. On the floor right in front of the water tanks there were photographs of the paintings in their heyday, so as that the curious visitor (or, in my case, the freaked out visitor) could see how they used to look before the water abraded them beyond all recognition and belief. It was like a little shrine to images that were damaged beyond repair and beyond any notion of beauty that they might have once held. Some of the photographs on the floor were of a very old woman posing next to the images of seemingly her younger self. At this point, the deepest and darkest levels of my imagination were working overtime. I could imagine a sinister collector using this place for his frightful collection not of paintings but bodies that he would hang in the murky water for his own macabre delight. Five minutes later we were out of the park and back in the safe bosom of our little red car. I had never been so totally terrified by a place. It could have been just my imagination, just the different images that popular culture has instilled in me, just a faux sixth sense of danger. I really don’t know. What I am certain about though is that I wouldn’t be willingly back there any time soon. What’s the spookiest place you have ever been to? Let me know in the comments below.